His was the face which launched a thousand memes - so why did Harambe the gorilla capture 2016's collective online psyche? It was a sad story that could have been even sadder. In May, a three-year-old child fell into an enclosure at Cincinnati Zoo. One of the Western lowland gorillas inside started dragging the boy around. "Mommy's right here! Mommy loves you!" the boy's mother shouted, as bystanders became increasingly panicked. Finally, fearing that the boy's life was in danger, a zoo worker killed Harambe with a single shot. The boy escaped without serious injury. The events were captured on a YouTube video which has been watched millions of times. Harambe's death touched off a heated - if predictable - debate about zoo welfare standards and whether lethal force was necessary. But what wasn't expected was what came next. Harambe became memeified. His image was spread far and wide throughout the internet. He became the subject of serious and unserious campaigns. And he was even memorialised in song. It started as a spontaneous and very real outpouring of shock and grief over the killing. "Had I been there, I would have gone into the enclosure myself," says Frank Paris, one of the people who used the hashtag #RIPHarambe to express his sadness. It quickly began to spread hours after the gorilla's death. Although he lived a few states away in Los Angeles, Paris, along with many others, was upset at Cincinnati Zoo's decision to kill the animal. "That day was a very sad day for me," he tells BBC Trending. "I absolutely would have risked my own life to save the boy. That's how sure I am that the boy was fine and that Harambe had no intention of hurting anybody." Of course, that's just one reaction from someone thousands of miles away, whereas zoo officials say they were right to take action to stop any potential serious injury to the boy. But Paris was not alone in his grief and anger. Aside from his canonisation on social media, there were candlelit vigils for Harambe. There were also campaigns targeted the boy's parents. Some online called for them to be prosecuted for negligence. The boy's mother was cleared of any wrongdoing. "There was definitely a sincere element of outrage over this," says Aja Romano, who writes about web culture for news site Vox. "It just spiralled out of control and was immediately a giant social trend, because it involved an element of supposed animal cruelty. You could argue that by keeping Harambe in the zoo to begin with, the zoo was fostering this unfair environment where the gorilla didn't really have a chance." That wave of emotion was in turn hijacked by comedians, pranksters and trolls who mocked those who were making so much of the story. "People online kind of get off on being mad about things that they don't actually care about," says Brandon Wardell, a stand-up comedian and one of those who poked fun at the Harambe mourners. "You didn't know Harambe, your life wasn't really affected by this." Wardell coined a jokey phrase that - to put it one way - sarcastically encouraged people to expose themselves in tribute to the dead gorilla. "I think I was probably drunk when I tweeted it and then it just got out of control," he tells Trending. It got him branded the "voice of a generation" by Rolling Stone magazine. Then things took a dark turn when the memes were picked up by the alt-right, an amorphous but internet savvy white nationalist movement. 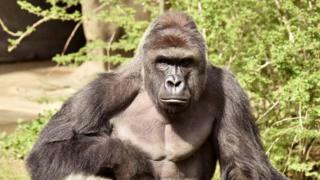 The gorilla's image was used in racist messages. "I feel like it was driven to the ground so quickly," Wardell recalls. "It stopped being funny to me two days after. "I didn't love that there were Nazis that were all of a sudden into a meme that I created." But the Harambe phenomenon was also too large to be totally owned by one fringe group. The Cincinnati zoo declared itself unimpressed with all the riffs on its dead animal - but that certainly didn't put an end to the jokes. Memes comparing Harambe to David Bowie, Prince and Muhammad Ali have since gone viral. He's been the subject of fake news stories, books, comics - and a parody of the Book of Genesis. Hear more on this story and others on the BBC World Service. "If you were really tired of seeing media hysteria dominate news cycles and dominate conversations, the sheer absurdity of Harambe as a social issue was a really easy thing to mock," says Romano, the Vox writer. "I think it spoke to a level of outrage fatigue. If you're seeing people freaking out about a dead gorilla, over say thousands of people dying in the Syrian refugee crisis, then what do you do with that anger? "The only way to sort of express your anger was to just turn this sort of worship of Harambe and turn this deep cultural grief over Harambe's death into a meme." Indeed, not just any meme, but the meme of 2016.